This week, Microsoft made Windows 10 a “recommended update” that will automatically download for many Windows 7 and 8.1 users. This is just Microsoft’s latest move in aggressively pushing Windows 10–here’s how we got to this point. Windows 10 is better than Windows 8, and probably a good upgrade for most Windows users at this point. But there are a lot of good reasons to stick with previous versions of Windows–like if you rely on a piece of software or hardware compatibility with software and hardware that won’t necessarily work with Windows 10. The update is even coming to business users, which is remarkably problematic. Microsoft’s push to upgrade Windows 7 and 8.1 users began with the “Get Windows 10” application, also known as GWX. This was rolled out through Windows Update and automatically installed on computers before Windows 10 was even released. 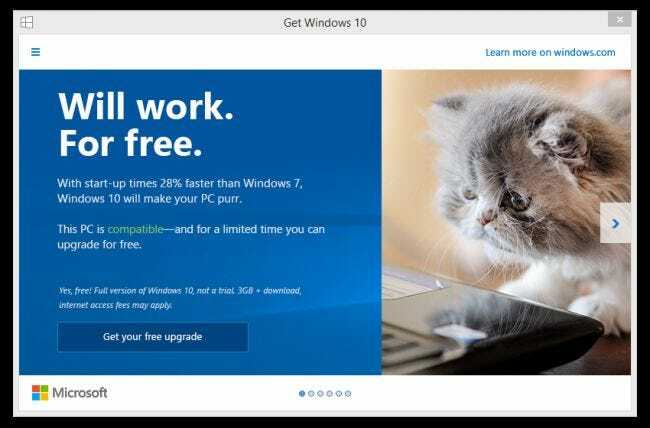 In its initial form, the Get Windows 10 application left a system tray icon with a pop-up that encouraged users to reserve a spot in line for the free upgrade. For those excited to upgrade, this was a nice opportunity, albeit a waste of system tray space. For other Windows users, though, it was confusing–they weren’t used to this sort of behavior, and had to search the web to find out if it was malware. That GWX notification became pushier and pushier over time, though. It’s become a large desktop window that regularly pops up with the options “Start download now” and “Start download, upgrade later.” Some people have even seen “Upgrade now” and “Upgrade tonight” options. Others only saw a “Start download now” button with no other option. In all cases, there isn’t a clear “Don’t upgrade” button–instead, you just had to close the window (until it pops up again later). You can uninstall the GWX update, but you’ll likely find Windows reinstalling it for you the next day, assuming you have automatic updates enabled. Microsoft provides instructions for disabling the Windows 10 upgrade, but they require hacking around in the Windows registry or Group Policy, ensuring most Windows users won’t feel comfortable doing this. The third-party GWX Control Panel app has been the best way to configure this, but it has to regularly update because Microsoft keeps finding ways around it. We’ve provided step-by-step instructions for both of these methods here. Microsoft’s support page says their method will work, and the developer of GWX Control Panel states that as of February 2nd, it should still work as well. That said, we’ve seen reports that the setting doesn’t “stick” for some people, so your mileage may vary. 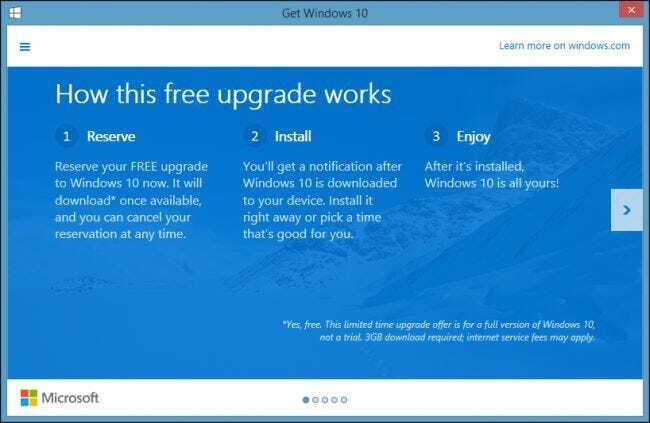 In October 2015, Microsoft marked the Windows 10 upgrade as a “Recommended” update in Windows Update with no warning. Previously, it was an optional update, which would not download until a user chose to do so. As a recommended update, however, many Windows 7 and 8.1 PCs automatically downloaded the 6 GB of data without warning. Some people found they were unable to opt out of the update and could only reschedule it. Some people with data-limited connections were pushed over their data caps. Microsoft said this was a “mistake” and reclassified the update…but only after it had already downloaded on many PCs. That didn’t last long, though. At the end of October, Microsoft announced that Windows 10 would become a recommended upgrade in February 2016, and sure enough, that’s exactly what happened. Unfortunately, this didn’t really solve the problem–it will still automatically download on many machines, and most Windows users probably didn’t hear about this or pay attention to the advance warning. If you have Windows 8.1, you can mark your connection as “metered” to prevent Windows from automatically downloading data, including the Windows 10 update. Windows 7 users, however, don’t have this option, so people with data caps are left with automatic downloads again. Microsoft actually advised metered Windows 7 users to disable automatic updates to ensure Windows wouldn’t download 6 GB of data on such connections. “If you are on a metered connection on Windows 7 or Windows 8.1, then you have the option of turning off automatic updates,” reads Microsoft’s blog post. It’s shocking that Microsoft would recommend this, since it’s clearly bad for security. There should be a way for Windows 7 users to get automatic security updates without worrying Windows 10 will suddenly download, but Microsoft doesn’t offer average users a clear way to opt out of Windows 10 updates. 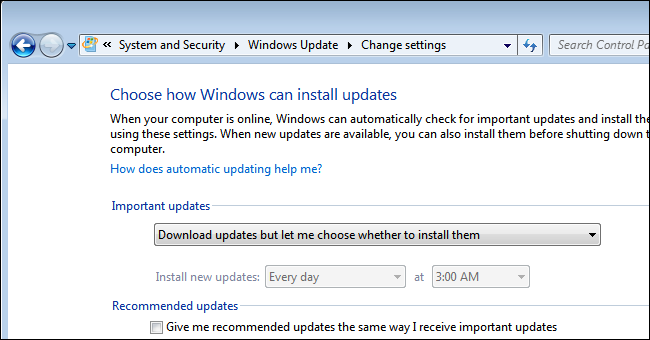 For now, you can change how Windows installs updates. Click the Start button and type “Windows Update”. Click “Change settings” in the sidebar and uncheck the “Give me recommended updates the same way I receive important updates” option. This should prevent Windows 7 or 8.1 from automatically downloading Windows 10. Alternatively, you can leave this box checked and set the dropdown to “Check for updates but let me choose whether to download and install them”. As if all that wasn’t enough, Microsoft made a surprising announcement on January 15. For the first time ever, Microsoft announced that Windows 7 and 8.1 would not be fully supported on Intel’s newest “Skylake” hardware, and that future chipset platforms would require the current version of Windows at the time the platform was released. This is a huge change. Intel’s Skylake chips had actually been available for months at the time of the announcement, so there wasn’t much advance warning. But, more importantly, Windows has never required this before. Microsoft has a list of specific Skylake PC models that will be officially supported until July 2017, after which they’ll only receive critical security updates if they don’t affect the stability of the Windows 7 or 8.1 platform. Microsoft says these PCs should be upgraded to Windows 10 by then. It’s unclear what this means for people who built their own Skylake PCs and installed Windows 7. Businesses that purchased Skylake hardware with the expectation that Windows 7 would continue being supported on them, as has historically been the case, were ambushed. This is just yet another way Microsoft is nudging people towards Windows 10. While it’s somewhat understandable Microsoft would want to simplify things and focus on only supporting new chipsets in the current version of Windows, Microsoft really should have announced this before Skylake was released instead of afterwards. The future doesn’t look good for downgrade rights, either. A Microsoft representative avoided answering the question of what this means for downgrade rights when Microsoft-watcher Mary Jo Foley asked. Speaking of businesses, Microsoft also wants business PCs to update. Windows PCs joined to an Active Directory domain will now receive “Get Windows 10” nags, too. This will only affect domain-joined PCs set to upgrade through Windows Update, not PCs set to receive updates through the organization’s own update server. There’s a way to block the update, too, but it also has to be done through group policy or the registry. In practice, this means the Get Windows 10 upgrade and associated nags will be arriving on many business PCs, whether they’re wanted or not. Yes, if the business has an IT person who’s on top of things, that person can block the upgrade. But many businesses don’t, although they may use a domain. So what’s next? Microsoft will likely make the GWX upgrade prompt even pushier and less easy to ignore, especially as the one-year deadline approaches on the free upgrade offer. If they wanted to, Microsoft could even push the Windows 10 upgrade on centrally managed business PCs. That upgrade could potentially be increased to “Important” status instead of “Recommended” in Windows Update, too. They haven’t said anything about this possibility, but given how things have been going…we wouldn’t put it past them. Microsoft’s one-year deadline for the free Windows 10 upgrade could also be extended. If Microsoft sticks to the deadline, those get Windows 10 upgrade prompts will expire and all go away on the anniversary of Windows 10’s release. But Microsoft could change its mind and announce it’s extending the upgrade offer, allowing them to continue pushing the Windows 10 upgrade, after hurrying people onto Windows 10 under the guise of a time-limited offer. Again, we wouldn’t be surprised if this happened. comment4, http://gekco.co.za/wp-content/uploads/formidable/download_hd_youtube_videos_mac_os_x.pdf download_hd_youtube_videos_mac_os_x, 911915, http://otohns.ca/wp-content/uploads/formidable/download_game_android_hack_mod_apk.pdf download_game_android_hack_mod_apk, >:PPP, http://www.dordtcentraal.nl/wp-content/uploads/formidable/dota_678_ai_rus_skachat_besplatno.pdf dota_678_ai_rus_skachat_besplatno, >:[, http://www.radiofacts.com/wp-content/uploads/formidable/download_gps_maps_for_nissan.pdf download_gps_maps_for_nissan, >:-P, http://iaevg.net/wp-content/uploads/formidable/download_hs_code_list_india.pdf download_hs_code_list_india, =))), http://www.fluxexperiences.com.br/wp-content/uploads/formidable/implementation_of_iso_14001.pdf implementation_of_iso_14001, ukgvzl, http://sfai.org/wp-content/uploads/formidable/download_eset_8_terbaru.pdf download_eset_8_terbaru, smoa, http://nationwaste.us/wp-content/uploads/formidable/i_don39t_care_i_love_it_download_mp3_free.pdf i_don39t_care_i_love_it_download_mp3_free, djq, http://www.coloradocompaniestowatch.org/wp-content/uploads/formidable/download_crack_the_sims_4_pc_gratis.pdf download_crack_the_sims_4_pc_gratis, >:DD, http://longislandheritagetrail.com/wp-content/uploads/formidable/if_pokemon_were_greek_gods.pdf if_pokemon_were_greek_gods, :-], http://presqueislelighthouse.org/wp-content/uploads/formidable/download_assistant_chrome.pdf download_assistant_chrome, %-], http://www.glenngoh.com/wp-content/uploads/formidable/download_debian_server_minimal.pdf download_debian_server_minimal, iou, http://www.idmworks.com/wp-content/uploads/formidable/download_adobe_reader_x_pro_free.pdf download_adobe_reader_x_pro_free, nqkoof, http://bemorelivemore.org/wp-content/uploads/formidable/download_fm_2014_completo_via_torrent.pdf download_fm_2014_completo_via_torrent, :[, http://www.bullercentre.com/wp-content/uploads/formidable/how_to_crack_ias_mains.pdf how_to_crack_ias_mains, 1773, http://freeanalyze.